I like to take aerial photos of islands and distinguishing formations or features on the land below. Among those I’ve been able to catch on photo on clear days are Mayon Volcano, Taal Volcano, the Chocolate Hills, Cagayancillo, and Corregidor Island. 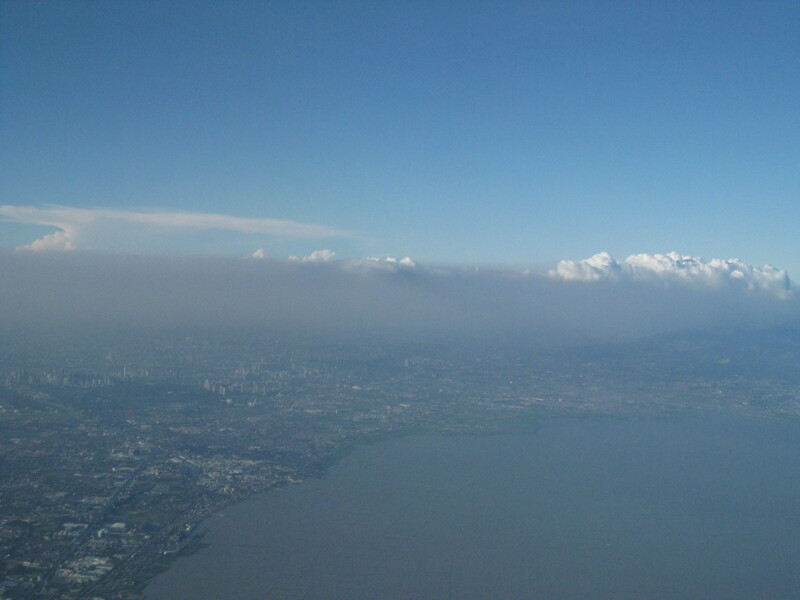 I took some snapshots while our plane was approaching Metro Manila around 5PM. 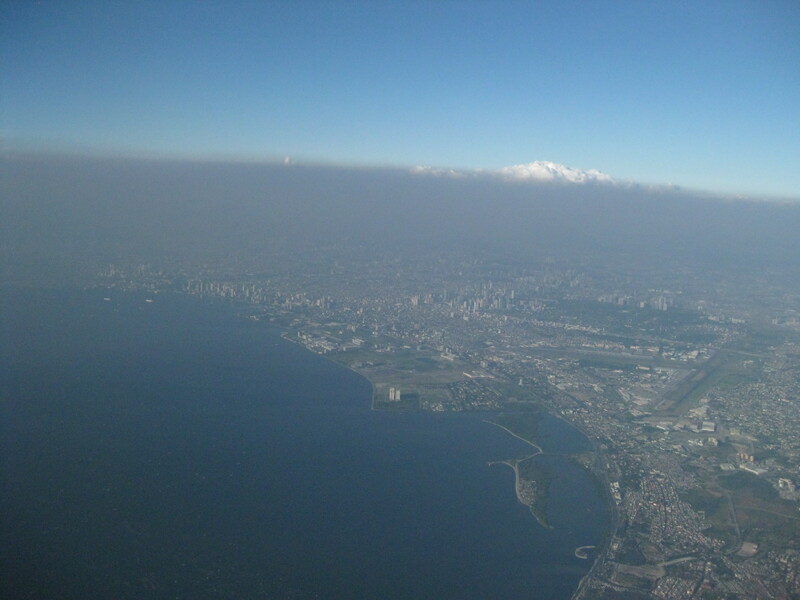 This time, what caught my attention was not the any land feature but something above it – the smog that covered Metro Manila and its surrounding areas. Approaching Metro Manila from Laguna de Bay, one can already sense there was something ominous in the air. 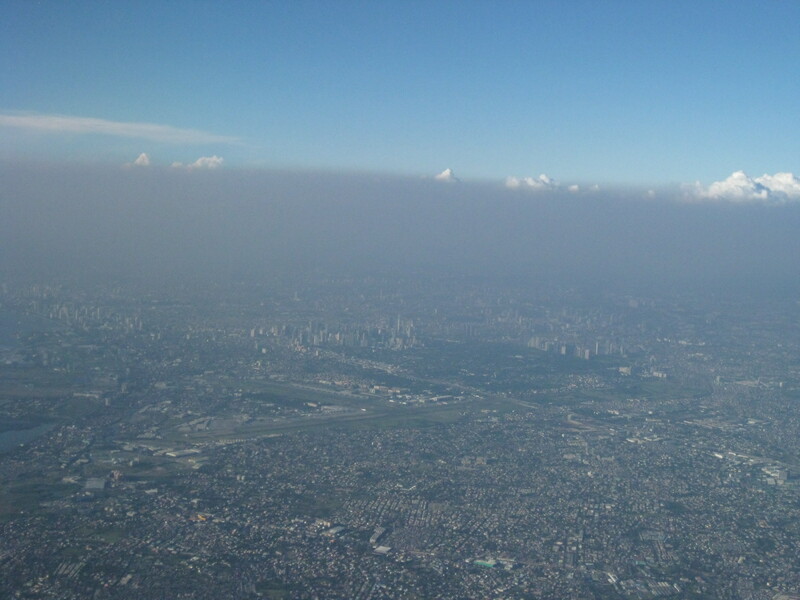 The smog over Metro Manila and parts of Rizal was not totally unexpected but I didn’t expect it to be this bad. That’s the SLEX on the left side of the photo, to give the viewer a sense of location. 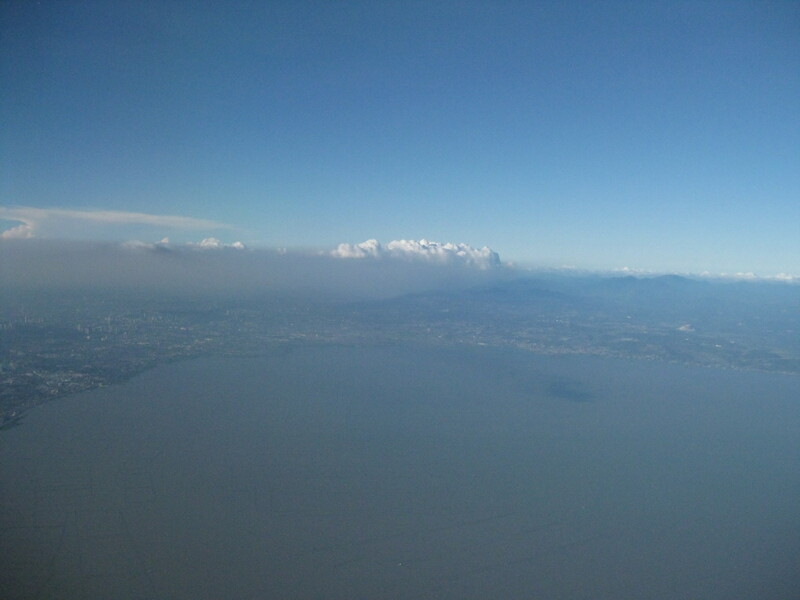 The thick haze make it seem as if the clouds in the horizon are the tops of some snow-capped mountain range. 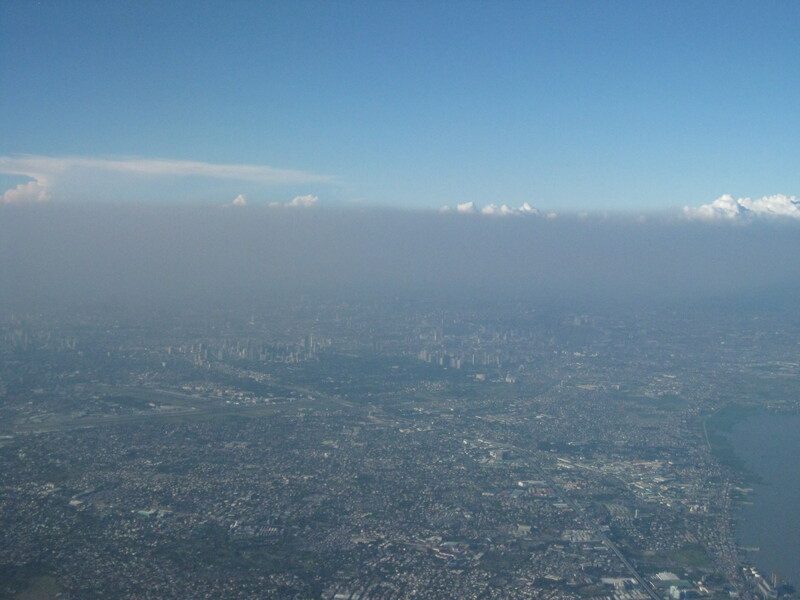 Smog over Makati and Ortigas – the main sources of this manifestation of air pollution are the emissions from road transport tailpipes. Yes Manila, that’s the air we breathe! This is what we inhale everyday and is the result of years of neglect and irresponsibility for those who cheated on the emission tests prior to vehicle registration, and continue to fail in the proper maintenance of vehicles. Nope, its not an out of focus photo or the effect of dirt on the aircraft windows. 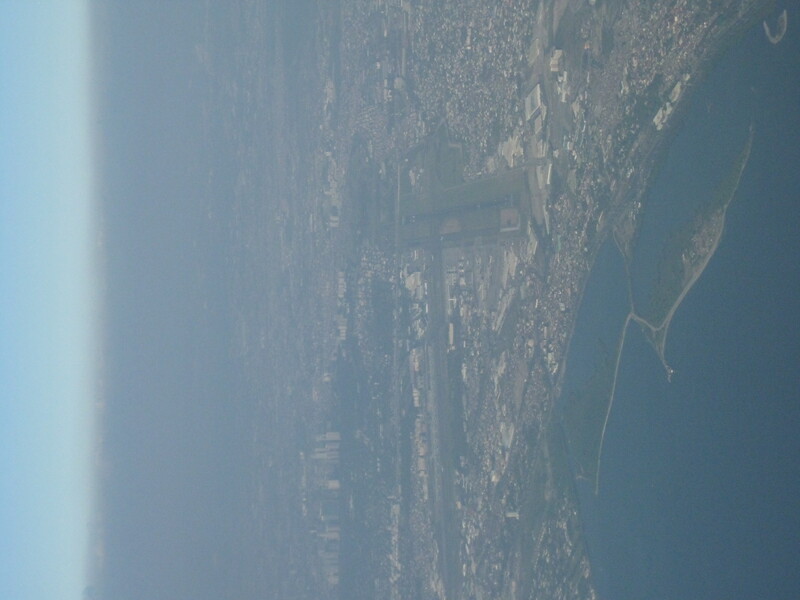 The blur in the photo is caused by the haze above and all around the airspace of Metro Manila. 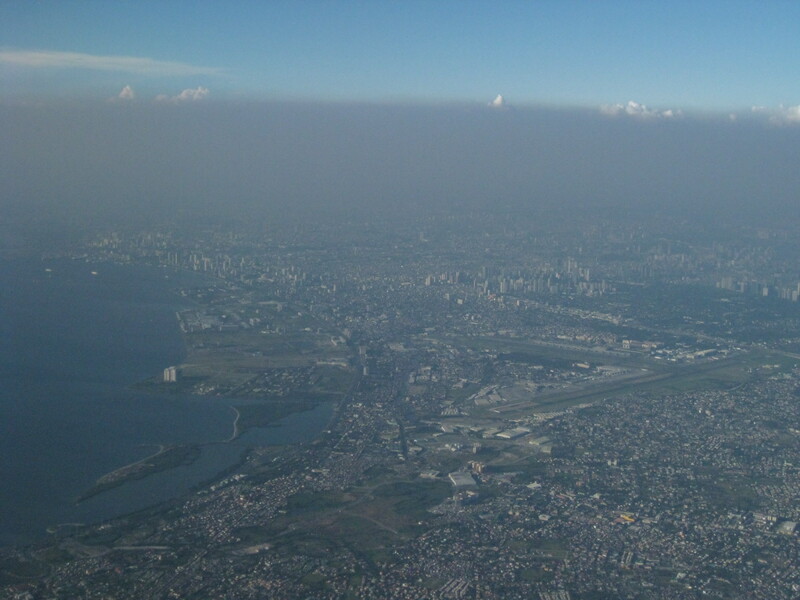 Manila with a thick band of air pollution above it. Pilots and tourists arriving by aircraft see this everyday and I’m quite sure that they have a bad impression about Metro Manila from this scene of the smog alone. 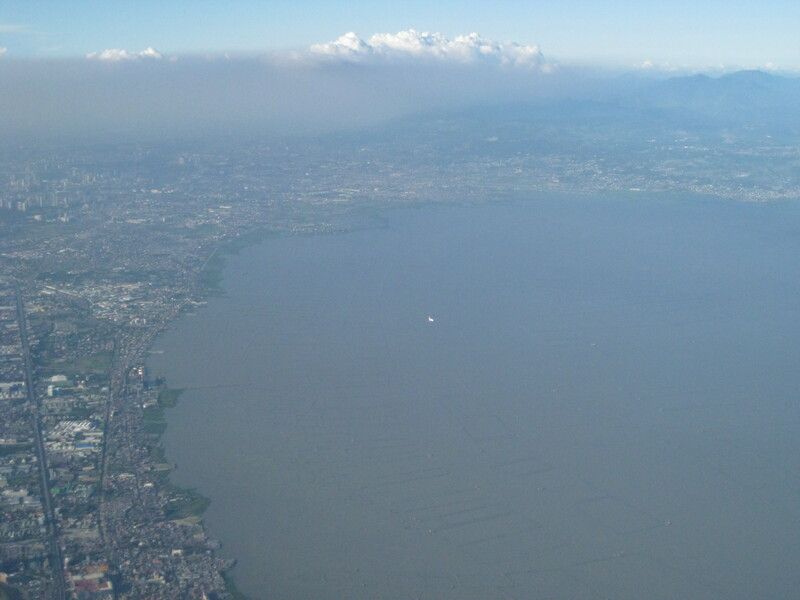 Another shot of the airport runways with the haze above. 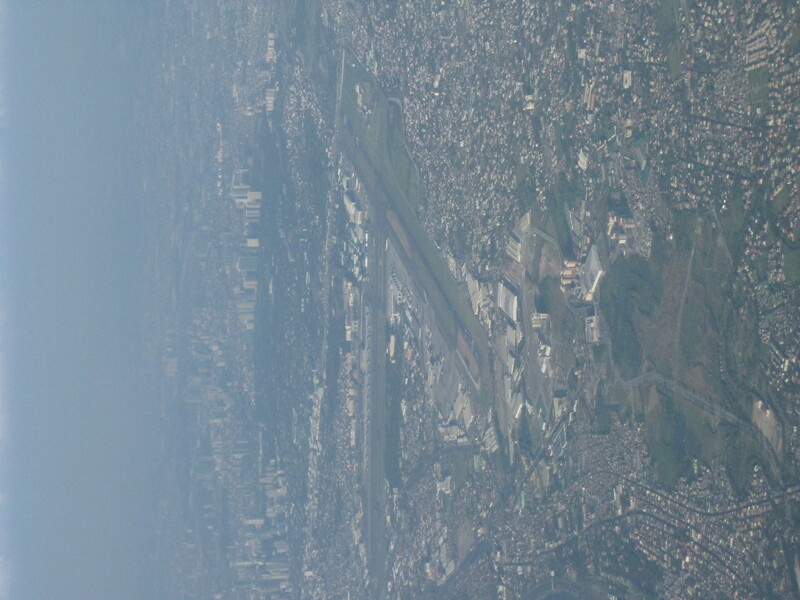 At the lower part of the photo and along the approach to NAIA’s main runway is a bird sanctuary being threatened by plans to reclaim and develop the area. The presence and persistence of smog over Metropolitan Manila should be a cause for concern if not outright panic considering the impacts of such pollution on our health. Unfortunately, people on the ground do not see this haze and would even likely interpret this as just cloud formations. Perhaps we tend to forget that one reason sunsets at Manila Bay are so colorful is because our air is already too polluted. It is sad that such realizations have not led to more urgent action from the government, often depending on NGOs to do much of the work. There is no other time than the present to be aggressive in such efforts as to clean our air. This is why we are pushing for sustainable transport…this is why we work! By d0ctrine in Air quality, Air travel on March 8, 2012 . A Question I have if you can,I have been to the philipines several times,(presently)in Laguna,and of coarse I breath the air !!! !,what is the possible health concearns to people with the smog,pollution in the air ????,. Of coarse we all know there will never be an easy cost effective answer to the problem !! !,too much traffic in too small places !!!,. It is to be said of coarse there are still many beautiful and pollution free places in the philipines,. Its been well documented around the world that air pollution affects our respiratory systems making many people susceptible to diseases. Solutions are not cheap, quick or easy but are necessary to improve quality of life where pollution is most severe. Of course, there are many places in the Philippines that are better off and typhoons are common so perhaps some of the pollution is dispersed during the wet season.